Athens, Greece — The Brookings Institution’s European Growth Project was completed on June 24 in Athens, with the third and final roundtable discussion on European economic issues, following previous meetings in Madrid (March 2013) and Berlin (May 2013). 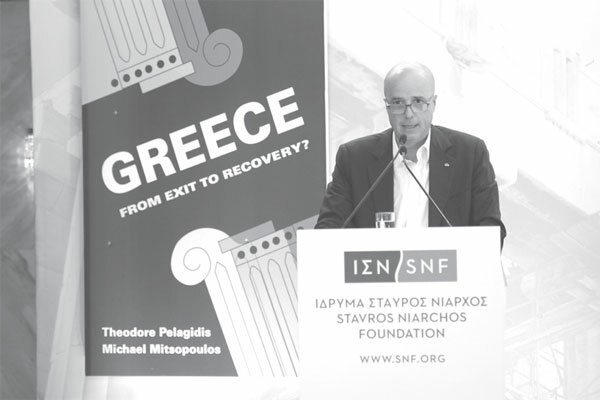 The roundtable conversation was followed by a public event to present Theodore Pelagidis’s and Michael Mitsopoulos’s book, Greece: From Exit to Recovery? The book is published by Brookings as part of the European Growth Project, which is supported by the Stavros Niarchos Foundation. Andreas Dracopoulos, Co-President of the Stavros Niarchos Foundation, speaks at an event in Athens, Greece on June 24th. The event marked completion of The Brookings Institution’s European Growth Project – an initiative supported by the Stavros Niarchos Foundation. The roundtable discussion included among others: Kemal Derviș, Vice President and Director, Brookings Institution, and Former Minister of Economic Affairs, Turkey; Jacques Mistral, Nonresident Senior Fellow, Brookings Institution, and Special Adviser, Institut Francais des Relations Internationales; Josep Borrell, Former Spanish Minister; Former President, European University Institute, and Jean Monnet Chair on European Economics, Universidad Complutense of Madrid; Anke Hassel, Professor, Hertie School of Governance, Berlin; Eleni Dendrinou-Louri, Deputy Governor, Bank of Greece; Yannis Stournaras, Governor, Central Bank of Greece, and Former Minister of Finance, Greece; William Antholis, Managing Director & Senior Fellow, Brookings Institution; Friedrich Heinemann, Head, Corporate Taxation and Public Finance, Centre for European Economic Research (ZEW), Mannheim; Anna Diamantopoulou, President of the Diktio Network for Reform in Greece and Europe, and Former EU Commissioner; and Andreas Dracopoulos, Co-President, Stavros Niarchos Foundation. The European Growth Project is aimed at examining the unfolding consequences of the euro crisis by focusing on the most affected countries (Greece, Italy and Spain), while examining a number of issues in relation to the crisis that were of great concern to Germany and France. The research work has culminated in the publication of two manuscripts: Greece: From Exit to Recovery? by Theodore Pelagidis (Brookings Nonresident Senior Fellow) and Michael Mitsopoulos, and Europe’s Crisis, Europe’s Future, a volume of essays/case studies on wider economic issues and reform in the Eurozone, as well as on the financial sector and social policies. The Stavros Niarchos Foundation (www.SNF.org) is one of the world’s leading international philanthropic organizations, making grants in the areas of arts and culture, education, health, medicine and sports, and social welfare. The Foundation funds organizations and projects that exhibit strong leadership and sound management and are expected to achieve a broad, lasting and positive impact for society at large. The Foundation also seeks actively to support projects that facilitate the formation of public-private partnerships as an effective means for serving public welfare. From 1996 until today, the Stavros Niarchos Foundation has approved grant commitments of $1.42 billion / €1.08 billion, through 2,685 grants to nonprofit organizations in 110 nations around the world. 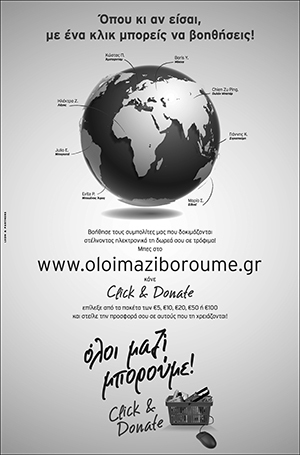 In 2012 and 2013, the Foundation announced two new initiatives of €100,000,000 ($130 million) each, to help the efforts to address the crisis in Greece. While the initiative in 2012, which has almost been completed, aimed to provide immediate relief against the adverse effects of the deepening crisis, the one in 2013 aims to address the high percentage of youth unemployment, seeking to create better employment prospects and new opportunities for the young. Next article The Magic of Greece! Let’s Go to Greece This Summer!